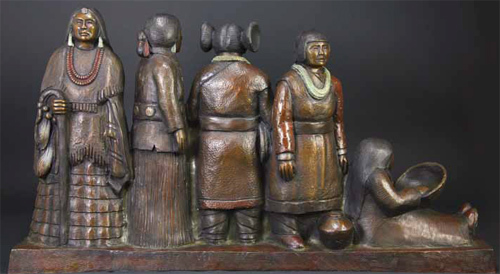 Doug Hyde, Intertribal Greeting, Bronze Edition of 35, 17" x 30" x 6.5"
Many contemporary Native American artists are finding themselves caught between two worlds – the one of the traditional art-making past that they’ve been born into and the one of the contemporary art world that informs their present. With many artists today, the result of these two distinctive and highly unique worlds is art work that pays homage to the past while also looking forward and embracing the here and now. 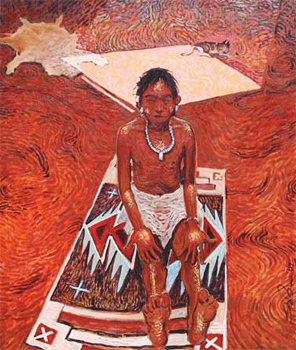 The Medicine Man Gallery in Santa Fe and Tucson represents artists like Shonto Begay (Navajo), Oreland Joe (Southern Ute, Navajo), and Doug Hyde (Nez Perce, Chippewa, Assiniboine). The artists will all have new work available at the Santa Fe gallery during Indian Market. Joe and Hyde are sculptors while Begay works in oils. Shonto Begay, Blessed, Acrylic on Canvas, 24" x 20"
Joe and Hyde work, respectively, in stone and bronze, and create work that honors their past and the traditions associated with it. 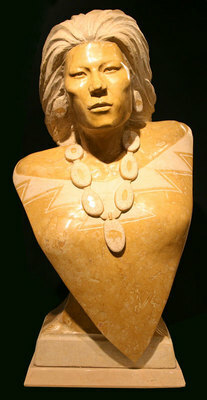 Oreland Joe, CA, Desert Wind, Portuguese Marble, 30.25" x 18" x 14.5"